WITH the glorious autumn sunshine it’s a real pleasure to be living in Almeria. Even though the working day is longer than back in Blighty and six days a week is the norm rather than the exception; there is always a favourite pit stop or view point to stop at and take it easy for a little while…. Then I look down and pick up a bit of litter or two. Most mornings (well ok every morning –borderline OCD) I slope down the wooden hill grab a few of my antiageingantifreeradicalsantianythingthatisbadforme pills (Alaskan blue green algae) and slump on the sofa to watch what’s occurred overnight in the world via the BBC News channel. Every few minutes however there is a weather report! What is the obsession with the bloomin weather on British TV? Low fronts, high fronts, stormy fronts, wide fronts even. As soon as the weather comes on I take the dogs off for a walk and get back just in time for yet another weather report. Here in Spain I open the curtains each morning look at the sky and usually think ‘its sunny’ and dress accordingly, rarely ‘oh its gonna rain’ or even rarer still ‘oh its bloomin raining’. I mentioned last week the really cheap petrol stations opposite the ITV near Albox on the A334 the other day and filled up at one I had not used before called Indapak. The friendly girl was really welcoming and when I said I had not been there before she gave me a few complimentary pens. It was a random act of kindness and it made my day as I am skilled at losing pens. Regular readers will recall that I hate litter and tidy up a few places of my own when either out with the dogs or driving past. Fellow columnist Tony Matthews has picked up on my thread and has also written about the mess in some areas. It’s easy for us to get angry and blame the council or A.N. Other but as long as we are mobile and not infirm we can all do something about the litter problem. 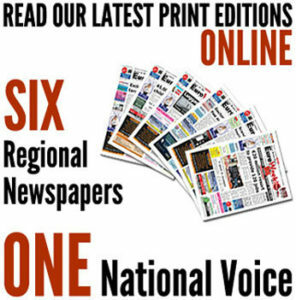 Consider that about 20,000 people a week read the Almeria edition of the EWN, if only half of us readers every day for a week picked up just one piece of litter as we went about our daily business that would be 70,000 pieces of litter tidied away in just a week -280,000 in four weeks! That’s one hell of a lot of rubbish removed from the beautiful Almerian countryside. If all 20,000 readers picked up one piece of litter daily for a month that would be over half a million fag packets, empty drink cans and sweet wrappers tidied away. We should all try and make a difference however small. I met a couple of unsung heroes recently who both pick up litter around the areas they live, One told me of a litter picker upper device he bought off E-Bay for less than a fiver, the other said she can often be seen wearing blue rubber gloves tidying up especially after the bin men have left a mess. So let’s do it readers – Keep Spain Tidy – pick up a piece of litter today and everyday…… Don’t forget to recycle it as well. Finally on a very happy note I would like to congratulate Clive Sarstedt and his beautiful new bride Andrea on their nuptials. The owners and staff of Titos Bar on Mojacar Playa put on a delicious buffet and it was the perfect venue for an excellent evening with the beautiful Mediterranean Sea as the backdrop. Clive has performed at Titos every Sunday summer afternoon for many years; currently with his talented sidekick Maurice. I wish Mr and Mrs Sarstedt all the very best for the future. Previous articleDo not catch this falling star!